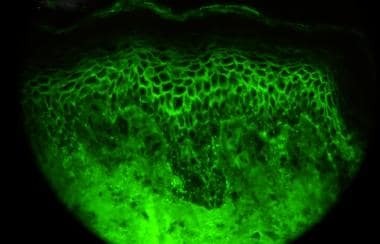 The evaluation of patients suspected of having paraneoplastic pemphigus includes obtaining samples by skin biopsy for routine microscopy and direct immunofluorescence (DIF) testing (see image below), followed by more sophisticated testing when indicated. Immunoprecipitation, immunoblotting and enzyme-link immunosorbent assay (ELISA) are sensitive assays that are very helpful in confirming the diagnosis of paraneoplastic pemphigus. Several new assays have been described [43, 44, 45] ; however, commercial availability is variable, and they may only be obtainable at research laboratories. Once the diagnosis of paraneoplastic pemphigus is established, further evaluation for malignancy may be necessary. Some patients have granular or linear deposition of complement, IgG, and/or IgM along the dermoepidermal junction. The combination of intercellular and subepidermal deposition of immunoreactants is a clue to the diagnosis of paraneoplastic pemphigus. IDIF testing is performed by using sera obtained from patients suspected of having paraneoplastic pemphigus and is a good screening test for this disease. Patients with high-titer antibodies exhibit both intercellular intraepidermal antibody deposition and deposition along the dermoepidermal junction. Patients with low titers only exhibit deposition intercellularly in a pattern identical to that of pemphigus vulgaris. Because circulating antibodies that bind to the cell surface of stratified squamous epithelia are common to all forms of pemphigus, other substrates, such as rodent bladder, can be useful in distinguishing paraneoplastic pemphigus from pemphigus vulgaris or pemphigus foliaceus. Binding to rat bladder transitional epithelium is specific for circulating autoantibodies from patients with paraneoplastic pemphigus, with a specificity of 83%;  sensitivity ranges from 75-86% depending on the study. Vesicular lesions express the most characteristic histopathologic features. Oral and cutaneous lesions show variable epidermal necrosis, suprabasal acantholysis, dyskeratotic keratinocytes, vacuolar interface dermatitis, and lymphocytic exocytosis. Substantial inflammation can be present, even in early lesions. While oral mucosal lesions show the greatest acantholysis, biopsy specimens of severe stomatitis may reveal only ulceration. Some skin lesions lack any acantholysis. When present, suprabasal acantholysis can result in clefts and tombstoning, which is the appearance of the basal cell layer below the cleft, and histologic findings can be indistinguishable from pemphigus vulgaris. A distinctive feature of paraneoplastic pemphigus is dyskeratosis. Dyskeratosis is a constant feature, but the number of dyskeratotic keratinocytes is variable. Dyskeratotic keratinocytes are found at all levels in the epidermis, especially within the zones of acantholysis, and they can be found in cutaneous adnexa. The presence of dyskeratosis in a person with a suprabasal acantholytic bullous disorder is a clue to the presence of paraneoplastic pemphigus. Interface dermatitis is a frequent finding in persons with paraneoplastic pemphigus, and it can be found both with and without acantholysis. Exocytosis of inflammatory cells into the epidermis is common, and the amount and degree are directly proportional to the degree of dyskeratosis. Satellite cell necrosis (a lymphocyte adjacent to a necrotic keratinocyte) can occur. Lesions showing marked vacuolar alteration are accompanied by melanophages in the papillary dermis. Dermal changes include a superficial perivascular infiltrate of variable intensity, which is mostly composed of lymphocytes. As in the oral mucosa, the pattern of cutaneous inflammation can be lichenoid, leading to a misdiagnosis of lichen planus. Papillary dermal edema is present in early lesions, whereas older lesions may exhibit mild dermal fibrosis. Anhalt GJ, Kim SC, Stanley JR, et al. Paraneoplastic pemphigus. An autoimmune mucocutaneous disease associated with neoplasia. N Engl J Med. 1990 Dec 20. 323(25):1729-35. [Medline]. Anhalt GJ. Paraneoplastic pemphigus. J Investig Dermatol Symp Proc. 2004 Jan. 9(1):29-33. [Medline]. Zimmermann J, Bahmer F, Rose C, Zillikens D, Schmidt E. Clinical and immunopathological spectrum of paraneoplastic pemphigus. J Dtsch Dermatol Ges. 2010 Aug. 8 (8):598-606. [Medline]. Martel P, Loiseau P, Joly P, Busson M, Lepage V, Mouquet H, et al. Paraneoplastic pemphigus is associated with the DRB1*03 allele. J Autoimmun. 2003 Feb. 20 (1):91-5. [Medline]. Liu Q, Bu DF, Li D, Zhu XJ. Genotyping of HLA-I and HLA-II alleles in Chinese patients with paraneoplastic pemphigus. Br J Dermatol. 2008 Mar. 158 (3):587-91. [Medline]. Czernik A, Camilleri M, Pittelkow MR, Grando SA. Paraneoplastic autoimmune multiorgan syndrome: 20 years after. Int J Dermatol. 2011 Aug. 50 (8):905-14. [Medline]. Qian SX, Li JY, Hong M, Xu W, Qiu HX. Nonhematological autoimmunity (glomerulosclerosis, paraneoplastic pemphigus and paraneoplastic neurological syndrome) in a patient with chronic lymphocytic leukemia: Diagnosis, prognosis and management. Leuk Res. 2009 Mar. 33 (3):500-5. [Medline]. Tsuchisaka A, Numata S, Teye K, Natsuaki Y, Kawakami T, Takeda Y, et al. Epiplakin Is a Paraneoplastic Pemphigus Autoantigen and Related to Bronchiolitis Obliterans in Japanese Patients. J Invest Dermatol. 2016 Feb. 136 (2):399-408. [Medline]. Taintor AR, Leiferman KM, Hashimoto T, Ishii N, Zone JJ, Hull CM. A novel case of IgA paraneoplastic pemphigus associated with chronic lymphocytic leukemia. J Am Acad Dermatol. 2007 May. 56 (5 Suppl):S73-6. [Medline]. Cummins DL, Mimouni D, Tzu J, Owens N, Anhalt GJ, Meyerle JH. Lichenoid paraneoplastic pemphigus in the absence of detectable antibodies. J Am Acad Dermatol. 2007 Jan. 56(1):153-9. [Medline]. Lim JM, Kim JH, Hashimoto T, Kim SC. Lichenoid paraneoplastic pemphigus associated with follicular lymphoma without detectable autoantibodies. Clin Exp Dermatol. 2018 Jul. 43 (5):613-615. [Medline]. Moreno-Artero E, Querol-Cisneros E, Rodríguez-Garijo N, Tomás-Velázquez A, Idoate MA, Ishii N, et al. Paraneoplastic pemphigus without detectable anti-plakin antibodies in a patient with non-Hodgkin lymphoma. Ann Hematol. 2018 Mar. 97 (3):543-544. [Medline]. Bennett DD, Busick TL. Delayed detection of autoantibodies in paraneoplastic pemphigus. J Am Acad Dermatol. 2007 Dec. 57(6):1094-5. [Medline]. Kwatra SG, Boozalis E, Pasieka H, Anhalt GJ. Decreased recognition of paraneoplastic pemphigus in patients previously treated with anti-CD 20 monoclonal antibodies. Br J Dermatol. 2019 Jan 15. [Medline]. Camisa C, Helm TN. Paraneoplastic pemphigus is a distinct neoplasia-induced autoimmune disease. Arch Dermatol. 1993 Jul. 129(7):883-6. [Medline]. Yong AA, Tey HL. Paraneoplastic pemphigus. Australas J Dermatol. 2013 Nov. 54(4):241-50. [Medline]. Proby C, Fujii Y, Owaribe K, Nishikawa T, Amagai M. Human autoantibodies against HD1/plectin in paraneoplastic pemphigus. J Invest Dermatol. 1999 Feb. 112(2):153-6. [Medline]. Poot AM, Diercks GF, Kramer D, Schepens I, Klunder G, Hashimoto T. Laboratory diagnosis of paraneoplastic pemphigus. Br J Dermatol. 2013 Nov. 169(5):1016-24. [Medline]. Leger S, Picard D, Ingen-Housz-Oro S, Arnault JP, Aubin F, Carsuzaa F. Prognostic factors of paraneoplastic pemphigus. Arch Dermatol. 2012 Oct. 148(10):1165-72. [Medline]. Hertzberg MS, Schifter M, Sullivan J, Stapleton K. Paraneoplastic pemphigus in two patients with B-cell non-Hodgkin's lymphoma: significant responses to cyclophosphamide and prednisolone. Am J Hematol. 2000 Feb. 63(2):105-6. [Medline]. Martinez De Pablo MI, Iranzo P, Mascaro JM, Llambrich A, Baradad M, Herrero C. Paraneoplastic pemphigus associated with non-Hodgkin B-cell lymphoma and good response to prednisone. Acta Derm Venereol. 2005. 85(3):233-5. [Medline]. Tilakaratne W, Dissanayake M. Paraneoplastic pemphigus: a case report and review of literature. Oral Dis. 2005 Sep. 11(5):326-9. [Medline]. Hung IJ, Lin JJ, Yang CP, Hsueh C. Paraneoplastic syndrome and intrathoracic Castleman disease. Pediatr Blood Cancer. 2006 Oct 15. 47(5):616-20. [Medline]. Marzano AV, Vezzoli P, Mariotti F, Boneschi V, Caputo R, Berti E. Paraneoplastic pemphigus associated with follicular dendritic cell sarcoma and Castleman disease. Br J Dermatol. 2005 Jul. 153(1):214-5. [Medline]. Wang J, Zhu X, Li R, et al. Paraneoplastic pemphigus associated with Castleman tumor: a commonly reported subtype of paraneoplastic pemphigus in China. Arch Dermatol. 2005 Oct. 141(10):1285-93. [Medline]. Koch LH, Layton CJ, Pilichowska M, Stadecker MJ, Barak O. Paraneoplastic Pemphigus and Castleman's Disease in the Setting of Herpes Simplex Virus Infection. Pediatr Dermatol. 2011 Oct 20. [Medline]. Perera GK, Devereux S, Mufti G, Salisbury J, Creamer D. PNP with Waldenström's macroglobulinaemia. Clin Exp Dermatol. 2005 Jan. 30(1):27-9. [Medline]. Wang J, Bu DF, Li T, et al. Autoantibody production from a thymoma and a follicular dendritic cell sarcoma associated with paraneoplastic pemphigus. Br J Dermatol. 2005 Sep. 153(3):558-64. [Medline]. Anhalt GJ. Paraneoplastic pemphigus: the role of tumours and drugs. Br J Dermatol. 2001 Jun. 144 (6):1102-4. [Medline]. Tull T, Papineni P, Cook C, Mee J, Bower M, Morar N. Paraneoplastic pemphigus in patient infected with the human immunodeficiency virus. Clin Exp Dermatol. 2014 Jan. 39(1):83-5. [Medline]. Eccersley LR, Hoffbrand AV, Rustin MH, McNamara CJ. Paraneoplastic pemphigus associated with systemic mastocytosis. Am J Hematol. 2009 May 27. [Medline]. Kennedy NA, Dawe S. Atypical paraneoplastic pemphigus secondary to endometrial carcinoma with no mucosal involvement. Clin Exp Dermatol. 2009 Jul. 34(5):e130-3. [Medline]. Kakurai M, Demitsu T, Iida E, et al. Coexistence of paraneoplastic pemphigus and bullous pemphigoid. J Eur Acad Dermatol Venereol. 2009 Aug. 23(8):962-4. [Medline]. Ishii N, Hashimoto T. A case of paraneoplastic pemphigus who shifted to pemphigus vulgaris. J Eur Acad Dermatol Venereol. 2008 Mar. 22(3):374-5. [Medline]. Coelho S, Reis JP, Tellechea O, Figueiredo A, Black M. Paraneoplastic pemphigus with clinical features of lichen planus associated with low-grade B cell lymphoma. Int J Dermatol. 2005 May. 44(5):366-71. [Medline]. Zhu X, Zhang B. Paraneoplastic pemphigus. J Dermatol. 2007 Aug. 34(8):503-11. [Medline]. Laforest C, Huilgol SC, Casson R, Selva D, Leibovitch I. Autoimmune bullous diseases: ocular manifestations and management. Drugs. 2005. 65(13):1767-79. [Medline]. Wang R, Li J, Wang M, Hao H, Chen X, Li R, et al. Prevalence of myasthenia gravis and associated autoantibodies in paraneoplastic pemphigus and their correlations with symptoms and prognosis. Br J Dermatol. 2015 Apr. 172 (4):968-75. [Medline]. Paolino G, Didona D, Magliulo G, Iannella G, Didona B, Mercuri SR, et al. Paraneoplastic Pemphigus: Insight into the Autoimmune Pathogenesis, Clinical Features and Therapy. Int J Mol Sci. 2017 Nov 26. 18 (12):[Medline]. Chou S, Zhao C, Hwang SJE, Fernandez-Penas P. PD-1 inhibitor-associated lichenoid inflammation with incidental suprabasilar acantholysis or vesiculation-Report of 4 cases. J Cutan Pathol. 2017 Oct. 44 (10):851-856. [Medline]. Chen WS, Tetzlaff MT, Diwan H, Jahan-Tigh R, Diab A, Nelson K, et al. Suprabasal acantholytic dermatologic toxicities associated checkpoint inhibitor therapy: A spectrum of immune reactions from paraneoplastic pemphigus-like to Grover-like lesions. J Cutan Pathol. 2018 Oct. 45 (10):764-773. [Medline]. Helou J, Allbritton J, Anhalt GJ. Accuracy of indirect immunofluorescence testing in the diagnosis of paraneoplastic pemphigus. J Am Acad Dermatol. 1995 Mar. 32(3):441-7. [Medline]. Huang Y, Li J, Zhu X. Detection of anti-envoplakin and anti-periplakin autoantibodies by ELISA in patients with paraneoplastic pemphigus. Arch Dermatol Res. 2009 Nov. 301(10):703-9. [Medline]. Mouquet H, Drenovska K, Lartigue A, et al. Detection and characterization of anti-envoplakin linker autoantibodies in paraneoplastic pemphigus using specific bead-based assay. Clin Immunol. 2008 Nov. 129(2):304-12. [Medline]. Probst C, Schlumberger W, Stocker W, et al. Development of ELISA for the specific determination of autoantibodies against envoplakin and periplakin in paraneoplastic pemphigus. Clin Chim Acta. 2009 Sep 6. [Medline]. Barnadas MA, Curell R, Alomar A, Gelpi C. Paraneoplastic pemphigus with negative direct immunofluorescence in epidermis or mucosa but positive findings in adnexal structures. J Cutan Pathol. 2009 Jan. 36(1):34-8. [Medline]. Khudhur AS, Di Zenzo G, Carrozzo M. Oral lichenoid tissue reactions: diagnosis and classification. Expert Rev Mol Diagn. 2014 Mar. 14 (2):169-84. [Medline]. Frew JW, Murrell DF. Current management strategies in paraneoplastic pemphigus (paraneoplastic autoimmune multiorgan syndrome). Dermatol Clin. 2011 Oct. 29(4):607-12. [Medline]. Peterson JD, Chan LS. Effectiveness and side effects of anti-CD20 therapy for autoantibody-mediated blistering skin diseases: A comprehensive survey of 71 consecutive patients from the Initial use to 2007. Ther Clin Risk Manag. 2009 Feb. 5(1):1-7. [Medline]. [Full Text]. Hohwy T, Bang K, Steiniche T, Peterslund NA, d'Amore F. Alemtuzumab-induced remission of both severe paraneoplastic pemphigus and leukaemic bone marrow infiltration in a case of treatment-resistant B-cell chronic lymphocytic leukaemia. Eur J Haematol. 2004 Sep. 73 (3):206-9. [Medline]. Frew JW, Murrell DF. Paraneoplastic pemphigus (paraneoplastic autoimmune multiorgan syndrome): clinical presentations and pathogenesis. Dermatol Clin. 2011 Jul. 29(3):419-25, viii. [Medline]. Disclosure: Serve(d) as a director, officer, partner, employee, advisor, consultant or trustee for: Living Proof<br/>Received income in an amount equal to or greater than $250 from: UpToDate.